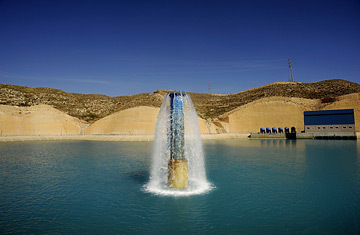 This desalination plant in southern Spain will be shipped to Barcelona due to the ongoing drought affecting the north. On May 15, a tanker ship from Marseilles will pull into a specially equipped dock in Barcelona's busy port, connect to a new pipeline, and discharge a liquid cargo essential to the running of the city. The ship will not, however, be carrying oil or petroleum. It is the first of many shipments of drinking water that form part of a program to slake the thirst of this drought-plagued city. Other proposals, such as a controversial plan to divert water from the Ebro river, have pitted the Catalan capital against farmers and other cities, in a mild foretaste of the water-wars that some have darkly predicted will afflict major regions of the planet in the coming years. Spain is in the grip of its worst drought in a century as a result of climate change  this year's total rainfall, for example, has been 40% lower than average for the equivalent period, and the country's reservoirs are, on average, only 30% full. The reservoirs serving Barcelona are only 20% full, and without significant rainfall, supplies of drinking water will likely run dry by October. "We're in crisis," says Joan Armengol, professor of ecology at the University of Barcelona. "And you can't leave 5.5 million people in crisis. The government has to take the bull by the horns." Emergency measures being taken by local authorities range from turning off Barcelona's beach showers to building a desalination plant that will be completed in 2009. Shipping in water is a stopgap measure to fend off the pressure on the city's supplies of this summer's thirst. The Catalan water agency has contracted 10 vessels for the next six months to ferry water from the French port of Marseilles and from the Spanish regions of Tarragona and Andalusia. The boats are expected to deliver some 92 million cubic feet of water each month, at a total cost of $68 million. But channeling water from elsewhere in Spain to Barcelona raises political tensions in an increasingly thirsty country. The supply ferried by boat from Tarragona, for example, will come from newly dug wells that risk salinating local aquifers, provoking concern among that region's farmers. Members of the Peasants' Union, an agricultural syndicate, protested on Sunday against the deliveries by parking about 100 tractors in the center of the region beneath a banner reading, "The fields of Tarragona don't have a drop to spare." Even the farmers to the north of the city are suffering from the city's all-consuming thirst. "Already, some farmers in the Ter area are prohibited from irrigating because the water is needed for Barcelona," says Peasants' Union spokesman Felip Domenech. "This diversion could cause entire harvests to fail." Ground Zero of Spain's new water wars, however, may be Barcelona's planned diversion of the Ebro, Spain's largest river, which is expected to be completed in October. The Socialist government of recently reelected Prime Minister Jose Luis Rodriguez Zapatero plans to build a pipeline alongside the highway to transport diverted Ebro water north to Barcelona. But when he was first elected in 2004, Zapatero's government overturned a similar plan, hatched by the conservative Popular Party (PP), to divert water south to Valencia. The fact that Barcelona's government is Socialist, while Valencia is ruled by the PP, has fed suspicions of political favoritism. "The government has humiliated us," said Francisco Camps, president of the Valencia region and a PP member. Murcia, another conservative-governed coastal region that would have benefited from the original diversion, is also outraged. "Barcelona is a major metropolis, and their economy depends on a steady water supply, so it is completely logical and necessary that they have this diversion," says Antonio Cerda, city councilman for agriculture and water. "But Murcia is one of the most important agricultural regions of Spain. We need the water diversion for our economy. It's only fair that we have one too." So heated is the debate that the Zapatero government has refused to even describe the Ebro pipeline to Barcelona as a diversion, calling it instead a "temporary solution," or, if pressed, a "mini-diversion". "It's totally political, and could have been avoided," says Professor Armengol. "Instead, it's become a war between territories." The Barcelona-bound boatloads of very expensive water are a means to ease that tension a bit. "It's a provisional solution," admits Barcelona mayor Jordi Hereu. "But it makes me calmer about our chances for avoiding an emergency." Maybe so. But it also points out how much more money and political energy will have to be expended to manage the distribution of an increasingly scarce resource. And the difficulties keeping the population hydrated in a politically tranquil Mediterranean democracy like Spain augur poorly for the drier and more desperate regions of the world.